The collapse, which involved a three-storey building that housed mainly pupils of a nursery and primary school, claimed at least 20 lives while 45 others sustained varying degrees of injury. But at the inauguration Tuesday, the commissioner named a retired Permanent Secretary in the state, Mr. Wasiu Olokunola, as the chairman of the five-man panel. Inaugurating the panel, comprising professionals from the private sector and in the built environment, Ogunleye said the term of reference of the panel included to determine the immediate and remote cause of the collapsed building at 63 Massey Street, Ita Faji, Lagos Island. 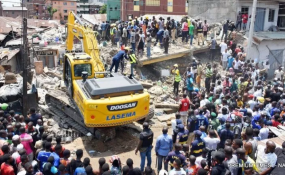 Ogunleye said the panel was also to proffer remedial measures to stem further building collapse in the future, adding that the panel was also to determine the level of negligence on the part of the developer or owner and the role of the state government. The commissioner added that the panel was to make recommendation for future efficient service delivery that would halt collapse of buildings in the state. Ogunleye said the recommendation of the panel would be acted upon as government was determined to stem the tide of collapsed building in the state. Olokunola, chairman of the panel, said the panel would ensure it did a thorough job.